Like the Toyota Tacoma, the Toyota 4Runner is well known amongst overlanders and prerunners alike. A few years ago it was common to see soccer moms driving lifted JK Wranglers, but that has since changed and now all the soccer moms drive lifted 4Runners. After installing a lift kit and bigger tires, it may be time for some upgraded lighting. 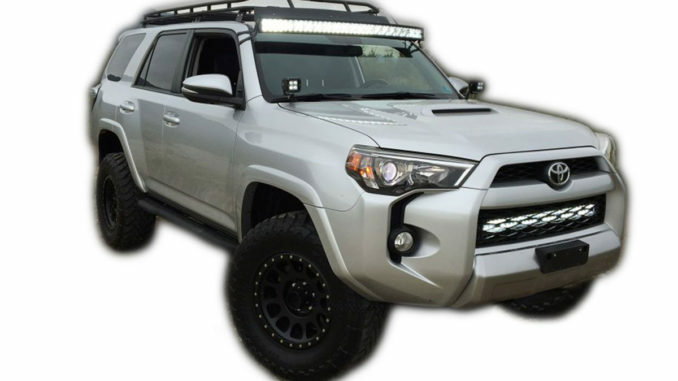 In this short guide, we will look at the best LED light bars for a Toyota 4Runner. We’ll discuss roof-mounted LED light bars, and bumper-mounted LED light bar and the best mounting systems for both. Mounting an LED light bar on your roof has a few benefits. The main benefit is a reduction of shadows on the trail. With your light bar mounted up high, you need to aim it down to put the light on the trail. The higher up the light bar is, the less pronounced shadows become. With your light bar mounted low, shadows become exaggerated, and you won’t know what bumps are big and what bumps just appear big. The brackets that come with your LED light bar require you to drill into your roof. Adding the weight of your LED light bar to the sheet metal on your roof it will create massive dents where you mount the brackets. The denting problem is why we will focus on LED light bars you can buy quality brackets for. We will start this list with a very innovative product from Rigid Industries. I will warn you now, this LED light bar is very expensive. If you’re looking for a more budget minded product, we have some listed below. Rigid Industries produces some of the brightest and toughest LED light bars on the market. Their latest ADAPT series can change from eight different beam patterns on the fly. Flood beam for going slow and a narrow spot beam for going fast. The ability to have an LED light bar that can adapt to any situation is paramount. This LED light bar output 27,392 lumens in the flood setting and 21,120 in the spot setting. The most power it uses is 374 watts in mode four and the least power it uses is 276 watts in mode eight. If you have the money there isn’t a better LED light bar available. Stepping away from very innovative and expensive LED light bars we have the Rough Country 40” curved Black Series. We like this product because of its decent quality, decent warranty, and low cost. The curved design also helps put more light on the sides of the trail where big rocks might not be visible. Plus the Black Series looks way better than a chrome LED light bar. This light bar outputs 19,020 lumens at 240W which is less than the Rigid Industries light bar listed above, but you get what you pay for. This LED light bar is also water and dust resistant so you won’t have to worry about it breaking in rainy conditions. Unlike the Rigid LED light bar listed above, they only cover this one by a three-year warranty. For the price, this LED light bar from Rough Country is hard to beat. If both of the LED light bars listed above are out of your price range, don’t worry we have a solution. We don’t recommend buying cheap Chinese light bars, but we’ve owned quite a few Auxbeam LED light bars in the past and loved them. Just know the quality isn’t the same with a cheap Chinese LED light bar and you might end up with a broken product down the road. This LED light bar from Auxbeam is part of their “Cross” series which integrates a cross-shaped daytime running light. This feature is a little gimmicky but it can look cool on the right truck. Auxbeam claimed this LED light bar outputs 24,000 lumens at 240W, but it’s likely closer to 18,000 lumens. This is because Auxbeam doesn’t test the light output of their products, but instead estimates it using who knows what method. Like we mentioned above, using the brackets that come with your LED light bar is a terrible idea. These brackets will require you to drill into your roof which can cause water leaks. Plus the weight of the LED light bar itself will dent the sheet metal on your roof. We always recommend purchasing vehicle specific brackets which mount to your factory roof rack or the A-pillars. For the Toyota 4Runner, Apoc Industries makes the best brackets without a doubt. They make the brackets from tough steel so you won’t have to worry about them bending. Plus the brackets are powder coated black so you won’t have to worry about the paint chipping. They come with all the necessary hardware for a quick and clean install. Although there are benefits to mounting an LED light bar on your roof, there are also some negatives. Mounting an LED light bar on your roof makes it more noticeable, and much more likely to be stolen which is a common occurrence. The biggest problem is windshield glare which occurs with light emitting from the LED light bar splashes down onto your windshield making it very hard to see. First up on our list is another Rigid Industries product. Mounting an LED light bar down low on your bumper makes it more susceptible to getting hit by things such as rocks. We wanted to recommend a very strong LED light bar with a good warranty backing it up, leading us to pick a Rigid Industries product. This LED light bar from Rigid outputs 13,800 lumens at 165 watts. We picked the Midnight Edition because of its sinister looks, but the brackets we recommend down below will put the LED light bar behind your grill. This means you could use a standard chrome LED light bar and it won’t be an eyesore. Second on our list for bumper-mounted LED light bars is the X5 Series from Rough Country. This LED light bar has much more of a flood effect thanks to its smaller projectors. The projectors are smaller because Rough Country fit a third row of LEDs in the middle. Although this increases total lumen count it decreases the range the light can reach. Thanks to that extra row of LEDs, the light bar from Rough Country outputs a very impressive 16,200 lumens at 180 watts. Unfortunately, the lower forces Rough Country to only back this product with a three-year warranty. Depending on how hard you wheel your 4Runner this short warranty may be an issue. If you’re still unsure what LED light bar you want, check out our full Light Bar Buying Guide for tons of information.